This tasty salad was the result of desperation, preparedness and luck — all helpful elements for fast meals on the fly. You know that advice you always hear to cook a big batch of whole grains early in the week for healthy, fast meals later on? Well, it pays off. 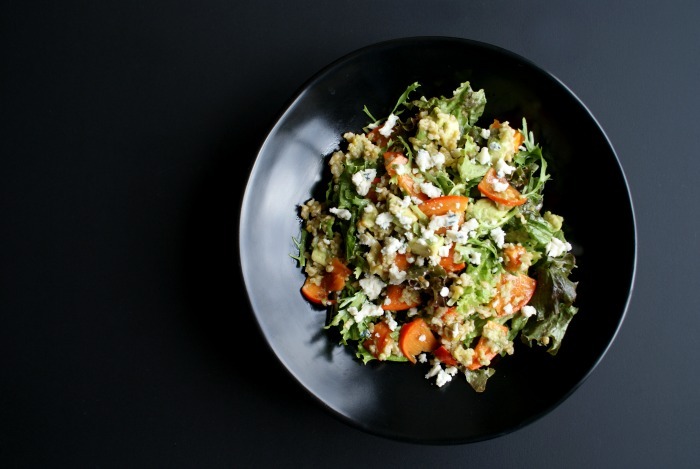 This salad — borne out of desperation, preparedness and luck — is proof. I needed to throw together a quick lunch to take out the door with me. And I was prepared with good ingredients on hand — clean lettuce greens, a persimmon and a batch of cooked freekeh. (What’s freekeh, you ask? Roasted young green wheat — it’s a quick-cooking whole grain that I predict will be everywhere at the upcoming Winter Fancy Food Show next month.) And I was lucky the avocado had reached just-right ripeness. On-hand components like these make for great fast meals. The result: a salad that was pleasing to the eye, massively delicious and satisfying. But preparedness was really the key here. Because I had the components on hand, it came together in less than 10 minutes. The dog watched me very closely as I ate this, which is always a good sign. Who says salad is just for summer? No one really, but come winter, we expect more heft from our food, and that goes for our salads, too. 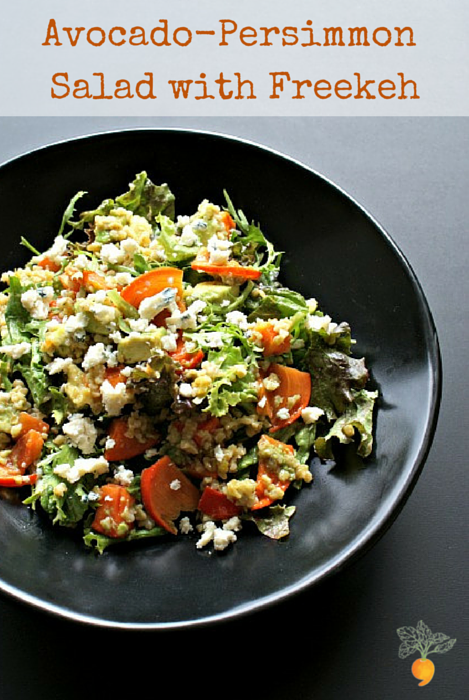 If you have the components on hand, this salad comes together in about 10 minutes. Whisk together the first 4 ingredients in a large bowl. 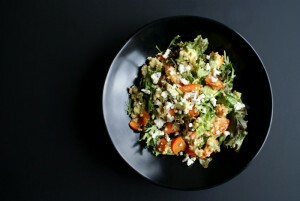 Add the greens, freekeh, persimmon and avocado, gently tossing with your hands to combine. Top with bleu cheese.